Micro Ingredients organic Spirulina tablets are the complete proteins and minerals supplements, available from Amazon Pakistan. It is enriched with all fundamental amino acids, vitamins, minerals, and nutrient. The formula is vegan, gluten free, hypoallergenic, and non-GMOs. 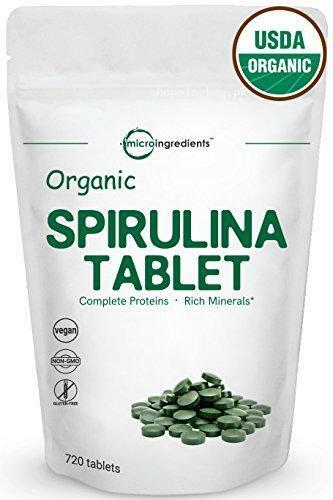 You can get the 720 tablets pack of organic Spirulina at the reasonable price. You just need to consume six tablets in a day for getting best result. Order now and get it at your home door with cash on delivery opportunity. Legal Disclaimer: These statements have not been evaluated by the Food and Drug Administration. This product is not intended to diagnose, treat, cure or prevent any disease. If pregnant/lactating or taking any medications, please consult your physician prior to use. Maximum Strength Organic Spirulina Tablet, 3000mg Per Serving, 720 Counts. Non-GMO and Vegan Friendly. Loaded with High Protein, Essential Amino Acids (Omega 3 6 9, GLA), Flavonoids, Vitamins (Vitamin A, Vitamin B2, Vitamin B12, Vitamin K), Minerals (Magnesium, Zinc, Calcium), Phytonutrients & Antioxidants. A Green Algae Superfood that Supports Colon Health, Digestive Function and Overall Well-being. No GMOs, No Additives, No Preservatives, No Artificial Colors, No Flavors, No Fillers and Gluten-Free. Manufactured at FDA Registered Facility in California and 1 Year Money Back Guarantee.